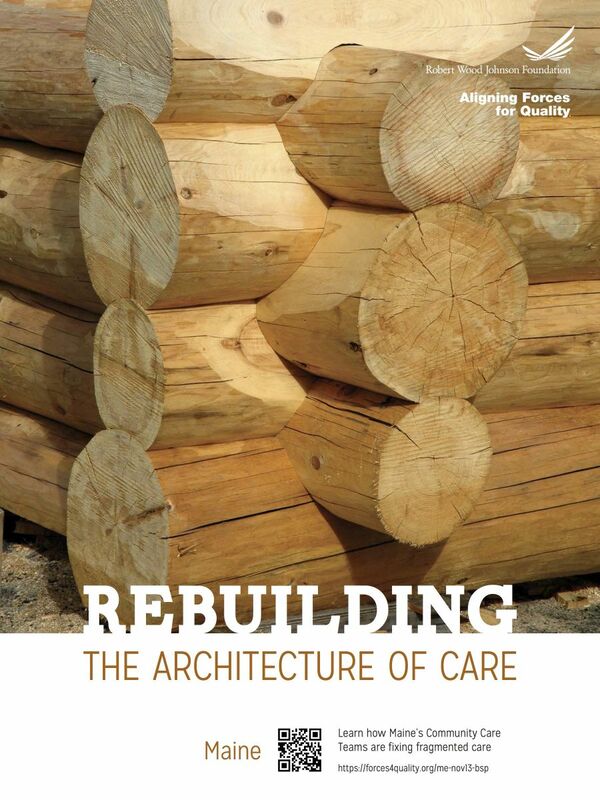 “The best way out of fragmented care is how we broker the architecture of care coordination,” said Dr. Barbara Crowley of Maine General Health. The Aligning Forces for Quality (AF4Q) initiative in Maine, headed by Maine Quality Counts (QC), is leading the way in care coordination with its patient-centered medical home (PCMH) pilot. The Alliance has found its niche in improving health care quality and lowering costs through community collaboration at the primary care level. Its PCMH efforts have contributed to a 5 percent reduction in emergency department (ED) visits, resulting in savings of more than $10 million. QC is sustaining and building on its PCMH efforts by aligning a community care team (CCT) with each of its 75 participating pilot practices and 80 MaineCare (Medicaid) Health Homes. CCTs are multi-disciplinary, community-based, care management teams that will work closely with the pilot practices to provide enhanced services for the most complex and high-risk patients. Together, the diverse group of nurses, social workers, health coaches, pharmacists, behavioral health specialists and other health professionals is a vital strategy for decreasing avoidable hospital admissions, readmissions, and emergency department visits. The teams help ensure effective coordination and communication across a patient’s full health care team and community supports. CCTs collaborate with primary care providers, Area Agencies on Aging, Healthy Maine Partnerships, community action programs, care navigators, social service providers, and others to provide support. “To be most effective, this support must be available close to where patients live and receive care, and from people in the community who understand and are trusted by the patients,” said CCT’s program manager, Helena Peterson, RN, MPH. Patients identified as high-risk or high-cost using payer or health plan reports. After identifying patients, CCT members connect with participants to assess where there are barriers to effective self-management. These visits may take place in the primary care practice, in the hospital, the patient’s home, or other community settings. Each relationship is centered on the individual patient with the goal of improving quality of life and health outcomes. “It’s not more health care that people need, it’s usually simple things,” said CCT member Mark DiTullio, a health coach from Community Health Partners. Working with Dr. Jeffrey Brenner and his team from the Camden Coalition for Healthcare Providers, QC is gaining a more in-depth understating of CCTs through technical assistance calls, webinars, onsite consulting, and learning sessions. “We will continue to develop our CCT model as an integral part of the Maine PCMH pilot to provide community-based, practice-integrated, multi-disciplinary care management to the most high-cost, high-needs patients in PCMH practices,” said Ted Rooney, Project Director, AF4Q Maine Alliance.